Some shorter notes on the things that aren’t actually instruments I think. 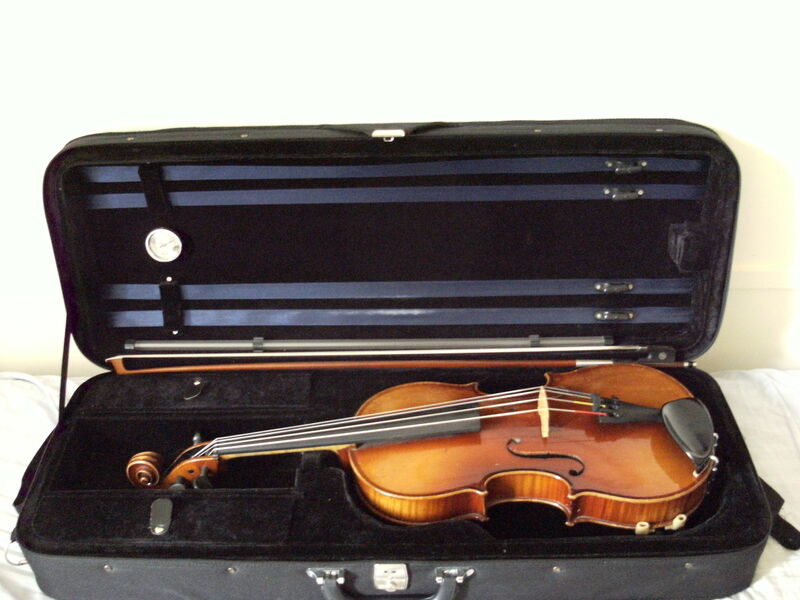 By G. Werner, bought from the Violin Shop in Chester some time around 2005/6. Hexagonal cross-section, on the lighter and springier side of violin bows but you can go a lot further. It works well for playing off the string, which I prefer, and getting energy from attack and staccato – it was never supposed to be a Wagnerian unbroken fortissimo bow largely because that’s never been a style of playing I favour! 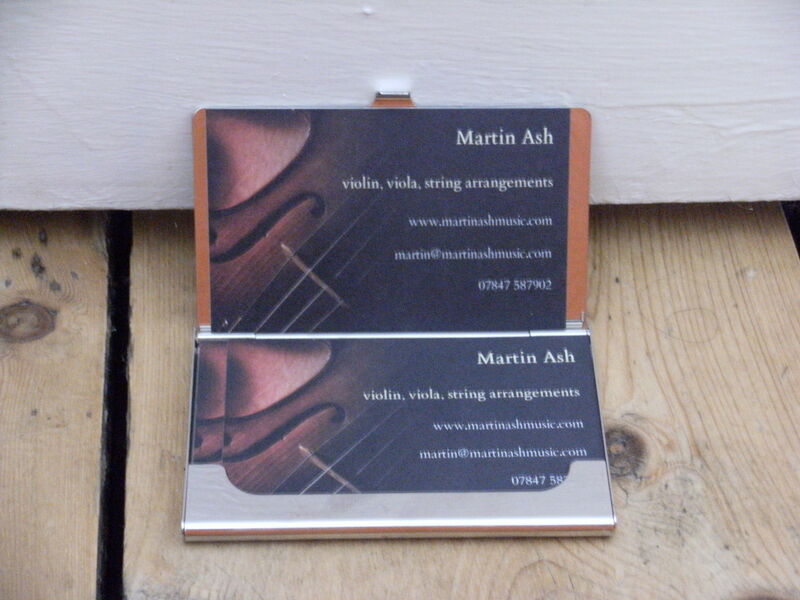 Bought from Simon Dubber of Witney at the same time as the viola. Made by D Carvalho, Brasil – apparently a very small outfit based on the outskirts of the forest (like it or not, good bows are still generally made from tropical hardwood) who sell direct to retailers in the UK and more or less go and cut down a tree when they need another one to start making bows from. So hopefully quite a bit more eco and pro-poor than some of the options on the market then, and those are both things close to my heart. Really a better bow by some way than I intended to fork out for at the time, but it made such a difference to the tone of the viola that I couldn’t resist getting it over a good but less special one about, er, half the price. This is, in some ways, a decidedly more eccentric instrument than my violin. I spent quite a while viola shopping around Oxford in the tail end of 2012, constrained partly by budget (mostly from an income tax rebate!) and partly by the discovery that even though I was just starting to grasp viola by transfer from or in addition to violin, most genuinely student or affordable instruments sounded too bad for me to put up with them! In the end I got this from Simon Dubber in Witney (against fierce competition). He quoted a price for it when it was still awaiting refurbishment, and later admitted that it had turned out to be better than he thought as he was working on it, but being the gentleman he is, let me have it at the original price when I decided I wanted it. I don’t really want to imagine what its actual value is, but it’s certainly my single most valuable possession. The instrument is unmarked and opinions vary a little, but the most likely estimate is that it’s inter-war, German-made or possibly somewhere a little south and east of that. 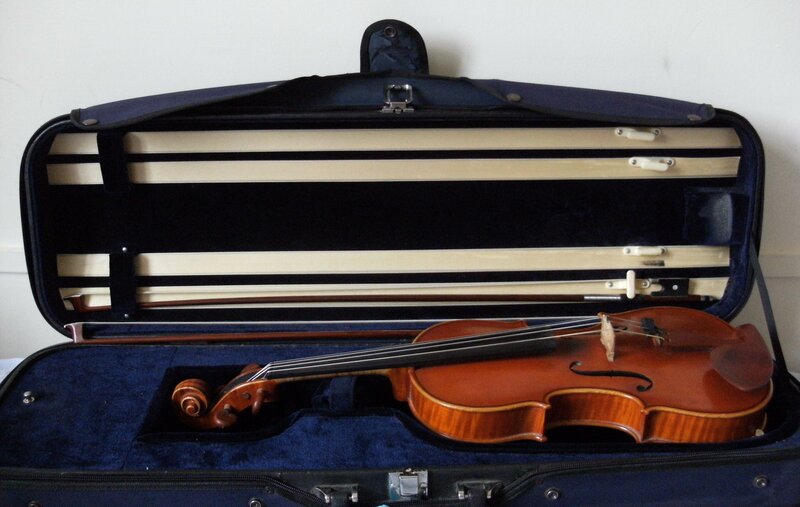 It’s a 16-inch back, so not huge for a viola (the normal range is perhaps 14.5 to 17) and a slightly odd wide nut (meaning the strings are further apart than usual), but has a very ‘big viola’ sound. I wanted an instrument as distinct as easily possible from the violin, rather than as many violinists who double do a lower version of the same. As a result, there is a strong high to low register pattern, with the upper pitches soft and plaintive descending to a powerful, dark (not to say potentially gravelly) low-end C-string sound – which is utterly unlike anything you can get out of a violin and I love! It’s also unusually loud for a viola, which given they often struggle to balance against violins and cellos is quite convenient. That also puts me in the fairly unusual position for a string player of generally working harder to produce nice and genuinely quiet passages than powerful but unscratchy fortes! As you will have realised, there are quirks to this instrument and it’s not always ‘well-behaved’. But I’ve grown to really like it, and I think it enables me to do a lot of things, some of them quite unusual. And I think we have a lot more to bring out of each other! So I thought I’d do a few posts about the stuff I use (as in equipment, not chemicals … ). I’ve had this violin from new, quite unusually. It’s circa 2000, Chinese hand-made at a point when China was starting to really move into ‘proper’ string instruments as well as mass-produced student models. They’re now a significant threat to the established European luthier countries. The Chester Violin Shop did some tweaking (chiefly of the soundpost positioning) back in about 2005, which really helped bring the lower registers and G string alive. It’s now in my opinion a really well-balanced and versatile instrument, clear and potentially penetrating at all pitches but also capable of a lovely quiet tone. It is possible to drive it too hard and wreck the tone, but what instrument can’t you say that of? It’s on the more powerful side of the violin range, which I find useful, though there are definitely louder instruments still around out there. Here’s hoping I can continue to use it as my main workhouse for a long time to come – it has certainly been a much-loved and frequent companion over the last 15 years or so! Ah, but aren’t they pretty? … well, firstly I’d better stop blogging and start Instragramming. But also, I must have multiplied the ‘worth’ of this site several times over last night, because it now has a shiny gallery page full of pictures of me looking odd while playing violin and viola (not at the same time … yet). I’ll be sure to add to it when more images become available! Well it’s a bit of an odd metaphor but freelance demo recording #2 is live on Soundcloud. Now to shift my attention to viola (besides running three String Project practices for our Elder Stubbs gig with a new lineup while Ben’s off jollying round, seemingly, half of western Europe). And I registered as self-employed with HMRC yesterday. It’s getting real! It was a pleasure and a privilege to record at Philip Bagnall’s Eastcote Studios with the String Project on Sunday, especially with the man himself at the desk. (It was also a long hard day that might have fallen better for me not right before a full-time working week, but we’ll gloss over that). With some serious hard work, quite a lot of repeated takes and patching and a monumental amount of snacks and tea, we managed to do the raw tapes of three full tracks and the string parts to a fourth (other bits to be overdubbed later). Anyone reading this with experience of good-quality recording will know that’s a serious amount to achieve in one day! Hopefully it should give us enough material, with some we already have, to put together a CD we can self-release, so watch this space (not too eagerly – a lot of editing, mixing, mastering, cover designing, etc. needs doing in between!). And I managed to make myself a ‘business card’ (the proper ones are on order from Vistaprint) to leave on the pinboard, and leave my contact details with Philip, which feels like some proper professional networking (the email campaign starts in a couple of weeks). So, if you ever look at a bit of this site (or my Soundcloud stream) other than the blog posts, you’ll notice some changes starting to be made. Basically, I’m ‘re-purposing’ the site from the church song writing that never really got off the ground to the freelance / session musician career I’m about to try and launch. The blog will run on continually, but the subject matter might shift a bit. Wish me luck!